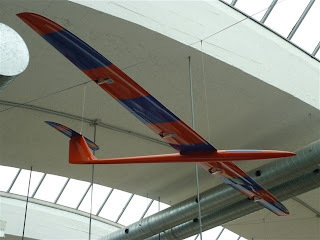 A Kinetic 100 v2 model airplane is now hanging in the Deutsches Museum Technik in Munich on permanent display including credits and a narrative on dynamic soaring. Deutsches is the largest technological museum of its kind and hosts a huge collection of historic originals. The airplane, with its 130" wing span, has clocked 498 mph, the current recorded soaring speed. Rhino and MasterCam were used in the design of the airplane. Technical details on the design process . . .